Outdoor kitchens are a growing trend and a fabulous addition to any large garden. But before you multiply your kitchen (and your budget) by two, step away from that pizza oven brochure and consider your options. Some of the most desirable kitchens are those that flow seamlessly from the interior to the exterior. Extending inside design themes into your outside space creates so much more than just an outdoor kitchen. It can define the ultimate area for outside entertaining. If that sounds perfect for your social lifestyle, it’s time to turn your kitchen inside out! Start thinking about how to bridge that inside-outside gap right from the initial design of your new kitchen. Here are some suggestions for reducing boundaries between inside and outside. If you’re planning a kitchen extension, include as much glass as possible and let the natural light flood in. For the real wow-factor, consider triple glazed, low frame profile bi-fold doors. These doors simply fold back at the lightest touch to effectively remove the fourth wall of your kitchen and allow step-free access from inside to outside space. Look for bi-folding doors that offer the highest ratings for UV protection, heat insulation and security. If your budget doesn’t extend to bi-fold doors, there are other ways to create the perception of a single space. Start by linking your design themes with matching colours and textures across both your indoor and outdoor furniture. Look for other ways to create connections between your inside and outside areas, such as lighting, finishes and use of specific woods. Using the same flooring materials inside and out gives a seamless feel to the transition between inside and outside spaces. Flagstones, for example, are hard-wearing and work particularly well in a glass-box extension. Another neat design trick is to use one material for the majority of the kitchen, then merge into your outdoor flooring just before the doorway to your outside space. Outdoor entertaining doesn’t have to be all about a basic brick-built BBQ or even a fancy pizza oven. Add a cooktop to your kitchen island and position it as close to your outside space as possible. With guests able to see you in action from both inside and outside, the stage is set to astound your guests with some culinary theatre! For the final deception, extend your inside lighting outside. Use small spotlights to create the ambience in your kitchen, and then continue the mellow mood by embedding solar lights into your deck or under the eaves of a summerhouse. If low hanging pendant lighting creates a central feature over your kitchen table, why not mirror the effect with string hung lanterns over your outside table or dining area. Keep a lid on compost bins, cover fruit bowls and plates to avoid attracting these little pests. Set fruit fly traps: pour red wine or vinegar into a ramekin, cover it with plastic wrap and poke holes in the top with a toothpick. Attracted by the smell, the flies crawl through the holes and then can’t find their way out. If you have any garden water features, make sure they are fitted with a pump or recirculating system to avoid standing water, which mosquitos breed in. Also, watch out for hidden water sources, such as pots, grill covers, sand buckets, baby pools and other children’s toys. With some imaginative planning and a few precautions, the outdoors can be as much a part of your kitchen as the room indoors. At Verbeek, our expert design team are ready to help turn your kitchen inside. Call us at 519-685-1811 or drop by our kitchen showroom at 189 Exeter Rd. London, ON. 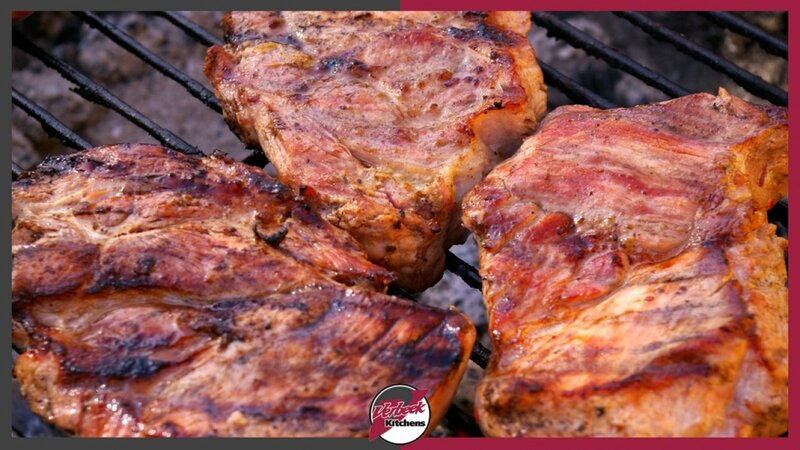 There’s nothing like sunshine to bring out the beers and the barbeques. Summertime is the season for socializing, yet there’s one golden rule when it comes to guests – you’ll always find them in the kitchen at parties! Whether your event is indoors or outdoors, winter or summer, there’s no getting away from it. Kitchens are, quite simply, a people magnet! So, why resist? ‘Go with the flow’ and create your perfect party kitchen. If you like to be part of the action, nothing can beat the open plan kitchen. Dedicated zones for food prep, dining and relaxation are ideal for seamless socializing. Your guests have ample space to sit back and relax, and you can still enjoy their company while you create a culinary masterpiece. Even the smallest space can offer opportunities for social seating. Why not use that under-utilized space beneath your window for a bench seat? Finish it for comfort with silky soft cushions and throws. For those with sufficient space and who love to entertain, building your kitchen around a centre island is a design must. Adding under counter storage will mean you can prepare food and chat with your guests without ever having to move from your work triangle! Use it to lay out those pre-dinner appetizers or a light buffet. Or, for a warming winter treat, have your guests help themselves to a steaming array of hot dishes brought straight from the stove. In summer, serve chilled salads and tasty dishes direct from the fridge, free from outside pests and insects too. For hosting large dinner parties, a double range oven with a 5-burner cooktop is a stylish centerpiece. Plus, all that extra cooking space means your culinary delights will finally reach perfection at the same time. Where possible, make room for a double sink. As every experienced party host knows, the double sink is worth its weight in dirty dishes! For the ultimate entertainment space, lighting design is crucial. Be sure to combine isolated areas of bright lighting with softer mood lighting. Installing separate dimmer switches will help you create an atmosphere to suit any occasion. Keep your dining table and countertops as clear as possible until the moment you serve. Why not invest in a oversized fridge and maximize your kitchen cabinetry to gain additional storage for special occasions. Store small appliances like toasters, blenders, etc. out of sight for clearer countertops every day. Easy to wipe countertops (and plenty of them) are invaluable when it comes to that big party clean-up. 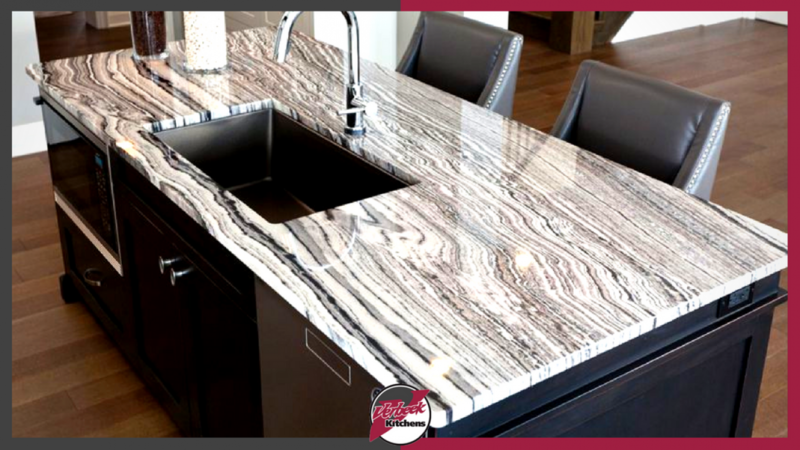 Laminate is a cost-effective choice, but for that real touch of cool all year round, stone such as granite or quartz is a must. Stone countertops are also easy to clean, long-lasting and look great too. At Verbeek Kitchens, our expert team can design a dream kitchen to suit your everyday needs and your party lifestyle. Start the fun today by calling us at 519-685-1811 or dropping by our kitchen showroom at 189 Exeter Rd. London, ON. 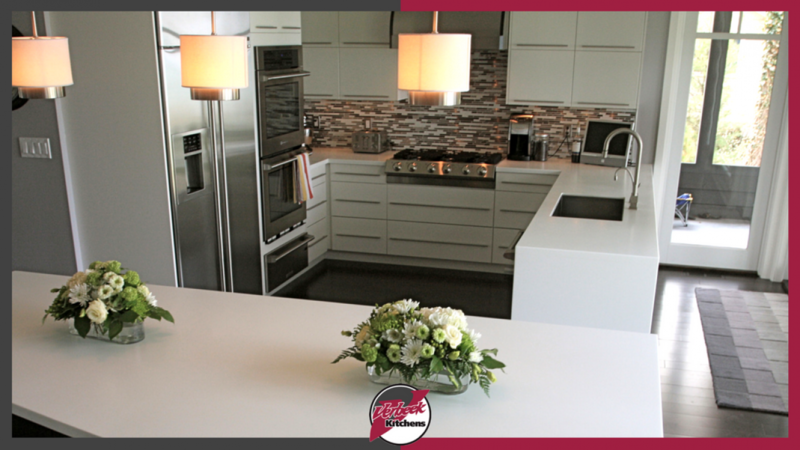 Verbeek is firmly established as one of the “go to” kitchen design companies in Southwestern Ontario. Since first opening our doors in 1977, we have been creating inspiring kitchens with a first-class fit and finish and all the latest technology. What you might not know is that we’re not all about kitchens! 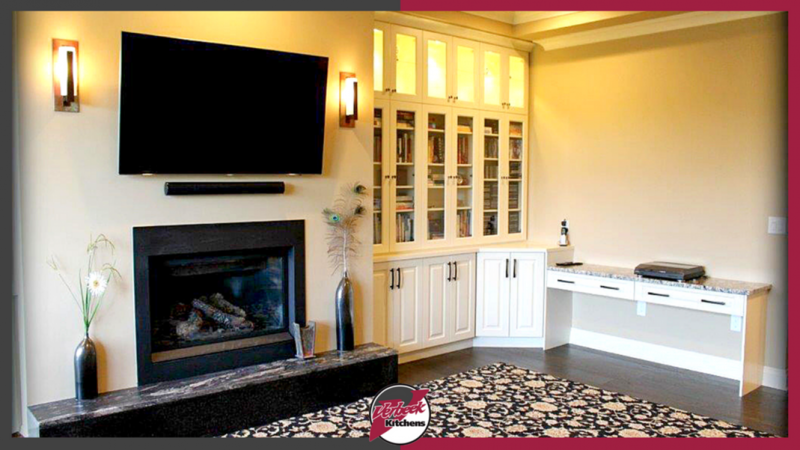 From custom cabinets to transforming under-used alcoves or corners, we specialize in practical, elegant design solutions for every part of your home. Everything you need to create your special space is right here at Verbeek. Make your laundry room as beautiful as your new kitchen with custom cabinetry from Verbeek Kitchens. We’ll create a design to fit your room and your requirements, and then install new cabinets and countertops to make your laundry room practical, efficient and good to look at! More and more Canadians are working from home these days, spending less time commuting on the roads and more time with their families as a result. That’s a lot of people working from their kitchen tables, lounge rooms or basements who could really benefit from a dedicated home office space! Our clients love the freedom an office space in their home gives them to work during the day, free from distractions. It also is the perfect room for children to do their school work free from the distractions of the family lounge area and TV, or bedroom-based games consoles, PCs and phones. At Verbeek Kitchens, we can design and build a home office that’s designed to your exact requirements, including cabinets, shelving, and sufficient desk and surface space for your PC, printer and other tech. Why not drop by our showroom at 189 Exeter Road, South London, Ontario and get a taste of the wide range of natural woods, colors and finishes we have available? Desperate to de-clutter? Give your clothes the room they deserve with wall-to-wall closets that glide shut with the touch of a finger. Talk to our design team about integrating elegant dressing tables, mirrors, drawers, shelving, shoe racks and even TV cabinets. Do you have an empty basement or just an odd corner that you’ve never known quite what to do with? Our cabinetry specialists can transform any under-utilized area with a custom-designed storage solution. Whether you’re looking for a playroom for the kids, a family games room, a home theatre room or even a basement bar, we can help. At Verbeek Kitchens, we have over 40 years’ experience in designing and planning new bathrooms cabinets and countertops. Call us with your requirements. At Verbeek Kitchens, we offer stunning storage solutions and specialty room designs which are perfect for you and your lifestyle. Make the impossible, possible. Call our design team at 519-685-1811 and book your consultation today. With more and more of us running our lives from our smartphones, a new generation of kitchen appliances are offering connectivity at the swipe of a finger. With the smart kitchen market expected to grow by almost 25% by 2025, this year’s trend is all about combining technology with style. So, we’ve looked at the latest appliances to bring your kitchen into the 21st century. There’s no shortage of gadgets for the kitchen improver or for those of us who choose to ‘build smart’ right from our first kitchen design. For clean-handed chefs and messy families alike, motion sense-equipped faucets continue to be a popular choice. For those who love to be in control and informed too, how about a smart egg tray? It will tell you how many eggs you have left and check their shelf life – and you won’t even have to open your fridge door! Have you ever stared blankly at the refrigerators in the grocery store wondering if you’re out of milk at home? Now you don’t have to. Big brands like Samsung are setting the bar on a whole new way of organizing family life. Their awe-inspiring Family Hub™ is available in 3 unique designs. The 4-door version gives you the option of turning the bottom right compartment from a fridge into a freezer and back again! 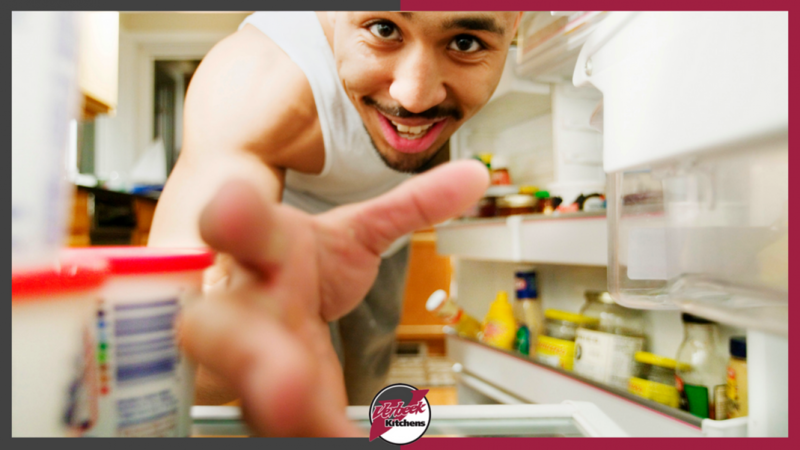 Thanks to interior cameras which take a photo every time you close your fridge door, you can check the contents of your fridge from just about anywhere! You can also set phone notifications to let you know when you need to go shopping. The app enables you to share calendars, photos and notes between your refrigerator and your family’s smartphones, so you can touch base anytime and anywhere. So, no more paper ‘to do’ lists or school sporting fixtures stuck to the fridge with magnets! If you just want have some fun, take advantage of the large screen on the Family Hub to stream music and videos while you cook. Just mind your fingers when chopping! These offer more efficient use of space and improved utensil washing. If you’re looking for that ‘super sparkle’, models with the higher-tech washer jet mechanism are a must. Why let warm air enter your entire fridge when you’re only reaching for a beer? Keep your fridge performing at maximum efficiency by storing popular items in an isolated area. See inside the fridge without having to open the door. Simple but effective! The stand-alone “range-style” appliance is fast becoming a thing of the past. Nowadays, induction cook-tops paired with separate single wall ovens are the oven of choice for amateur chefs and busy moms alike. Using magnets to heat a pan directly, rather than indirectly, induction cooktops facilitate precise temperature control and faster cooking. 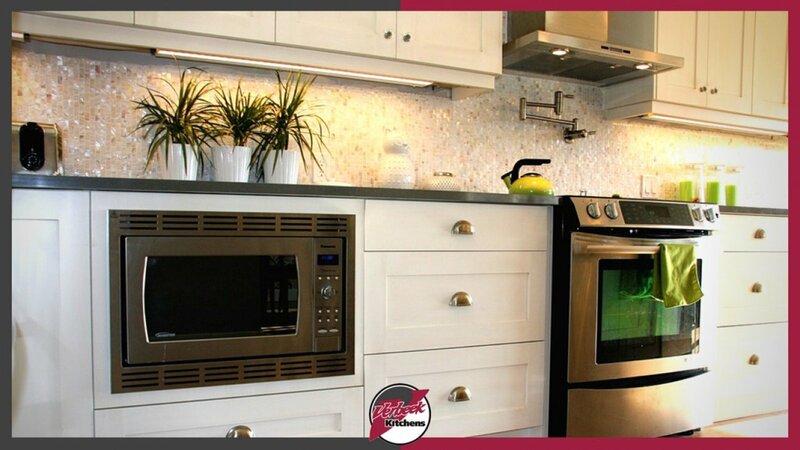 If you’re looking for style in a limited space, a wall oven with French doors is a perfect choice. For smartphone addicts, a wall oven equipped with Bluetooth will also enable you to control the functions remotely! A research study carried out by Mintel in 2017 found that nearly half of Canadians feel guilty when they eat foods they consider unhealthy. It’s hardly surprising then that steam ovens rank highly on the wish lists of the health conscious. They help retain food nutrients and flavor better than conventional ovens. Better still, they cook in super quick time! At Verbeek, we work with our partners to design and install new kitchens which include your choice of innovative appliances. For more details, call us at 519-685-1811 or drop by our kitchen showroom at 189 Exeter Rd. London, ON. More men are spending time in the kitchen than ever before. 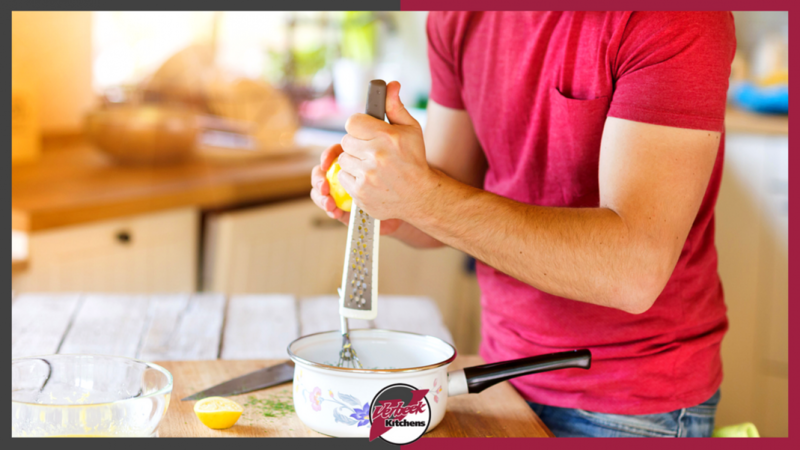 According to Statistics Canada, in 1986, just 29 percent of fathers reported having to cook during a typical day. In 2015 that number doubled to 59 percent. Changing attitudes to equality and the increase of women in full-time work is a large contributor to this upward trend. The rise of TV cooking shows like Diners, Drive-Ins and Dives must also play a big part. With its likeable, laid-back frontman Guy Fieri, this is just one show currently making a hit with male audiences. Finally, it seems, the kitchen is cool! Love to entertain? An open plan arrangement that combines a functional kitchen with a living or dining room is still a top design choice. If you don’t have the space, scatter stools around your kitchen island and make sure it’s big enough for guests to share without encroaching on the all-important food prep. Floor to ceiling cabinets are great for maximizing storage space – and perfect for housing the TV and wireless sound system! Low-maintenance quartz countertops or other engineered stone products are this year’s must-have. Resisting stains and scratches, these super-tough surfaces are hassle-free. “Roughed-up” finishes are another favourite. For a powerful contrast, try pairing weathered oak cabinets with smooth marble countertops. If you love your gadgets, then there’s no better place than the kitchen to start your latest collection. From motion sensor automated faucets to smart refrigerators and flash freezing devices there’s a whole world of gourmet gizmos out there. You’ll find it hard to resist! The on-trend colours for high contrast kitchens are soft grays and rich blacks. For a dramatic contrast go with black appliances and darker hardwood floors. (Unlike their light finish counterparts, they won’t show every speck of dust and dirt!). Grow your way to the top of the 2018 kitchen wish list and ‘go green’ … literally! A green island or cabinetry paired with gold hardware makes a huge statement. For a subtler edge, give plain white urban-style tiles a lift by using green grout instead of white. Or, for a real touch of cool, why not go retro and introduce a mint green fridge? Tired of stooping over your chopping board and banging your head on low cabinets? Kitchen design is not only about style – ergonomics is key too. Elevate counters and kitchen islands to the height you require. Hang your cabinetry and vent hood a little higher than standard (but not too high to be ineffective). Ask us about custom cabinetry to have your kitchen at just the right height for you. The first rule of a kitchen for 2018 is – there are no rules! Mix and match everything from cabinetry to hardware in an assortment of colours and finishes. It’s a great way to create an informal, relaxed space and highly individual that you and your friends will love to hang out in. 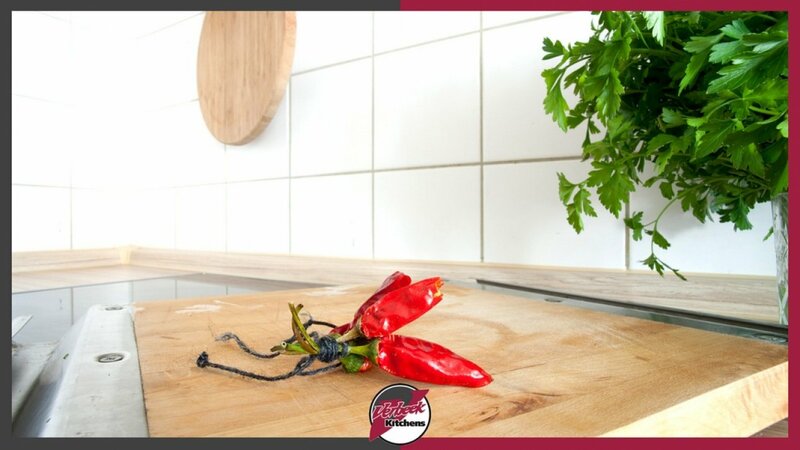 At Verbeek, our team is ready to design a kitchen which suits your needs and your lifestyle. Kick-start your new kitchen today by calling us at 519-685-1811 or dropping by our kitchen showroom at 189 Exeter Rd. London, ON. Your new dream kitchen will be on-trend, stylish, and functional, but what does it say about you and your family? Simply by adding some unique personal touches, you can turn a showroom-pristine kitchen into a customized space that reflects your character and lifestyle. Create the perfect on-trend urban vibe with elegant metal bar stools around an island of natural maple or walnut. Wire mesh fruit bowls and pendant lamps hanging from intricate chains are also great textural features. Or, for a more overt industrial feel, set stainless-steel cabinetry and appliances against all wood cabinet interiors and floors. Personalize cool white finishes by mixing the expected with the unexpected. Potted plants with an abundance of delicate, green foliage will provide contrast and visually soften straight edges. Make a statement with a round table or round top stools in any kitchen defined by straight lines. If you have a window nestled between tall cabinetry, take full advantage of the space. Build in a comfy window seat and accessorize with textured cushions for that added touch of softness. Or ask the team here at Verbeek about our custom cabinetry solutions for any underused space, including storage. A rainbow assortment of coloured seating injects vibrancy and focal points into any darker kitchen colour scheme. Stand out from the crowd by introducing some quirky ‘one-off’ furnishings, whether chic new designer pieces, or one-off, upcycled items painted in bright colours and given a new look. Give your contemporary kitchen family history and character by adding a few period pieces. A long-forgotten family heirloom might be just the thing for a jolt of originality. Alternatively, rummage around some garage sales, visit your local antique store, or take a look at the range of architectural salvage sites online. If you’re all about chic, then glossy white leather-topped stools against dark granite countertops will conserve your cool class. Or reverse the contrast with a black-veined white quartz countertop and jet black bar stool tops. Under-used spaces brought to life: Make alcoves, archways and spaces under staircases work again as practical, built-in storage areas. Celebrate high ceilings: A floor to ceiling display cabinet can be an impressive addition to any kitchen. Perfect for showing off kids’ crafts, family photos and keeping your personal treasures safe. From day one, you’ll be involved in your design, ensuring your storage solution is totally unique to you and perfect for your needs. At Verbeek Kitchens, we create dream kitchens to match the character and needs of all our customers. Our team will be happy to answer all of your design questions. Call us at 519-685-1811 or come into our kitchen showroom at 189 Exeter Rd. London, ON. Great lighting makes for a great a kitchen. A good lighting plan can make all the difference between an OK kitchen and a welcoming space you will enjoy every minute of every day, all year round. Mood matters. Think about the atmosphere you’re trying to create. Most modern kitchens are not just a space to cook in, but also a social hub for family and friends. Plan in flexibility to create isolated areas of bright light and softer mood lighting in other areas. Installing separate dimmer switches is one way you can adjust the lighting and create the atmosphere to suit any occasion. Planning and positioning. Be generous with the number of lights. Too few lights and too much of the kitchen will be under-lit. Also check the positioning – lights that are poorly positioned or directed will create large areas of shadow. Conversely, take care with lights that might reflect off high polished cabinetry or countertops and cause glare. On the wall. Wall-mounted lights can make a room feel larger, particularly in galley kitchens where the room is narrow. They also offer a softer lighting option where glare might be an issue. The right light bulb. 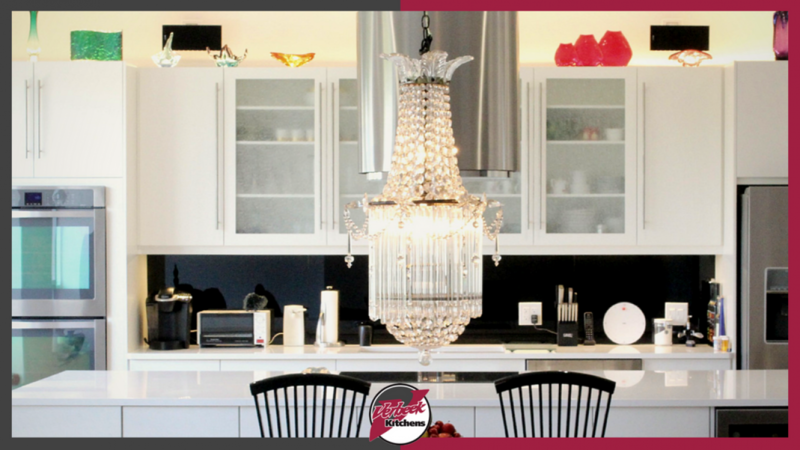 Something as simple as your choice of light bulb can change the whole ambience of your kitchen. For crisp clear light, look at bright LED lights. If you’re looking for a cozier feel, choose bulbs with an off-white glow, available in energy efficient LEDs, CFLs or halogen bulbs. You can have a variety of light bulb types in various positions too – no need to stick with one type throughout. Let there be light. Pale colored walls, tiles and backsplashes reflect light, but darker tones will absorb it. So, if you’re going for a darker more dramatic color scheme, you may need more light fixtures to bring out the true character of your space. Ambient lighting spreads light evenly throughout the space, creating a daylight effect. Fluorescent fixtures provide bright, high-efficiency lighting for whole-room illumination in larger spaces. LED flush ceiling lights are equally effective in a smaller kitchen. ‘In between’ lighting supplements the ambient light for areas that need just a little more illumination, such as sinks, islands or eating areas. Chandeliers and pendant lighting suspended from the ceiling work well and also add a touch of elegance and variety to the space. Task lighting directs light to illuminate specific tasks such as food preparation. Concealed under cabinet lighting is ideal for illuminating countertops, or to provide atmospheric lighting at the base of floor-standing cabinets. Accent lighting. Once all your beautiful new cabinetry and countertops have been installed, you’ll want to show them off to their best! Track lighting enables a series of smaller lamps to be rotated and directed individually, putting all your well-chosen design features under the spotlight. At Verbeek Kitchens we specialize in creating your custom dream kitchen to suit your specific needs. From the first measurements to the creation of your unique 3D kitchen design, we offer a service that goes to the finest level of detail. Our team will be happy to answer all of your design and lighting questions. Call us direct at 519-685-1811 or come into our kitchen showroom at 189 Exeter Rd. London, ON. Your kitchen countertop is one of the most hard-working areas of your kitchen, a multi-function surface for everything from food preparation to kids’ science projects! Kitchen countertops are a major expanse of surface that seamlessly links your whole kitchen together from one end to the other. Countertops have a significant impact on the light in your kitchen, whether bouncing back light from a light-coloured surface, or adding drama with a dark, statement colour. 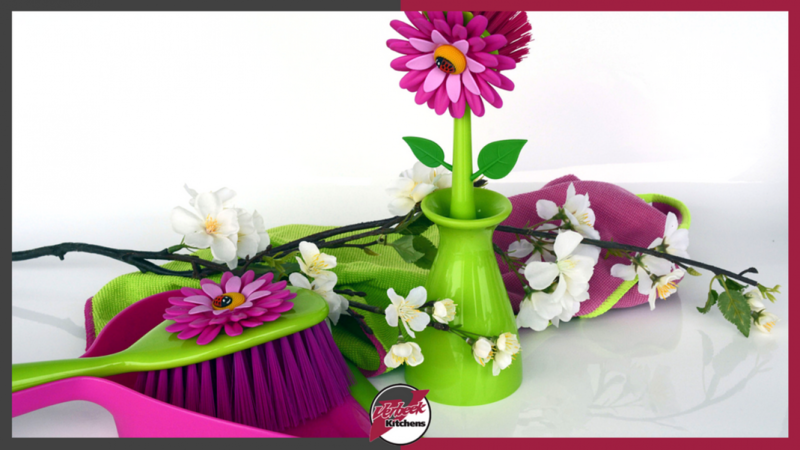 Spring sunlight is wonderful, but now that we have 13 hours of daylight per 24 hours, it’s also showing the parts of our home that need a good spring clean!